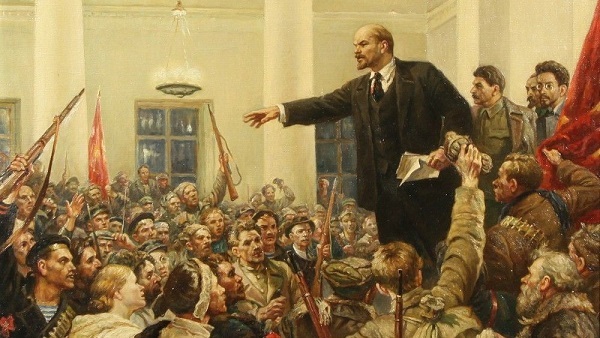 1917 Russia Revolution – Vladimir Lenin, the leader of the Bolshevik Party, addresses a crowd of revolting soldiers, sailors, and workers in Petrograd. I gave the woman a brief response from economics and she responded that her Canadian friends were happy with their system so there was no reason for the US not to have something similar. Of course, if we limit our knowledge to just what the woman’s friends in Canada say about their system then without a doubt we should rush to the ballot box and vote for the most socialist Democrat candidates we can find. The problem with her logic is that she assumes her personal experience and those of her Canadian friends are all she needs to solve the problem of healthcare. When I taught economics, I frequently ran into the same attitude in students. Their personal experience didn’t match the textbook economics world so the textbook must be wrong. Hayek called that kind of thinking pseudo-reason or rationalism in his last book, The Fatal Conceit. Pseudo-reasoning says that for something to be true, the individual must be able to understand it completely and foresee all of the consequences. In other words, personal experience trumps all other knowledge. Most people in the West labor to remain ignorant of economics. Jim Wallis, founder of Sojourners, urges his sycophants to abandon the “gospel of scarcity” (economics) and embrace the “gospel of abundance” (socialism). According to Wallis, God created the world with enough wealth so that all would be rich if wealth was evenly distributed. Of course, Wallis is ignorant of economic history in which the world suffered frequent mass starvations from the beginning of history until the advent of capitalism. But why not have universal free healthcare? The simple answer is that the wealth of the world is limited. Socialists have no problem understanding that the world’s physical resources, such as oil and copper, are limited. They continually scream that we’re using them up so that future generations won’t have any. We create wealth when we extract those resources from the earth and convert them into something people can use, Those goods are wealth, not money. We can print all of the money we want, but it won’t create any more resources. The US has a limited amount of wealth regardless of what Wallis thinks and that applies to healthcare.